Want to make good use of the power of influencer marketing to promote your nonprofit, charity or social enterprise? Check out these tips by Lilian Sue. For this post, I wanted to put the focus on how an overarching marketing concept such as influencer marketing can have a positive impact on non-profits. We have a better understanding now of how social media, content marketing and email marketing can help a non-profit organization exceed fundraising goals, raise event attendance and even recruit scores of new volunteers, but what about influencer marketing? How does influencer marketing fit in the larger picture on marketing strategy for non-profits? As it turns out, the concept of influencer marketing may not be as foreign as you think. 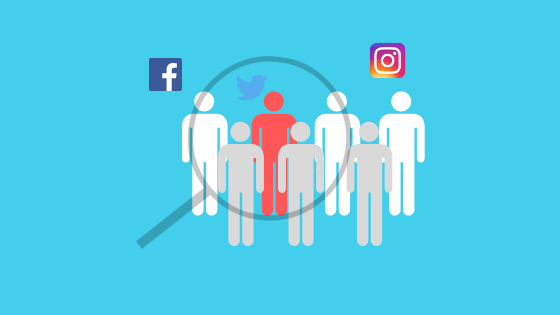 You may have potential influencers in your audience-dedicated fans who have been donating to your fundraising campaigns, volunteering at your events and sharing any and all organization news. In marketing, we call these individuals brand advocates. Brand advocates are passionate people who believe in what your brand represents and the message behind it. They’re the ones who are sharing updates via social media, encouraging others to donate and attending and volunteering at your events. Brand advocates champion your cause-and they’re also spreading the word with new audiences every day. So what’s the difference between a brand advocate and an influencer and how do you turn a brand advocate into one? A brand advocate will champion your cause for free-and they may or may not have a large audience. An influencer, whether they’re high-profile or micro, has a dedicated, highly engaged audience who trusts their recommendations. An influencer promotes your cause after entering into a partnership with your organization. 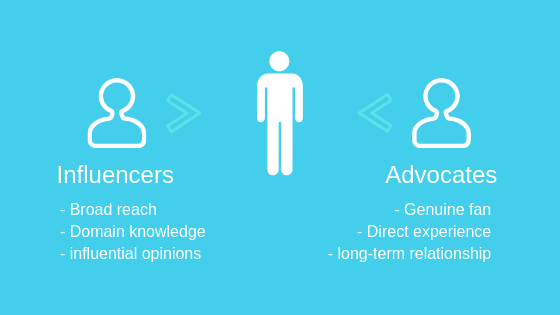 With a specific set of criteria, any brand advocate can become an influencer. Learn more about the types of influencers and how you can form partnerships with them. Being specific about your influencer strategy will help you find the right people to work with. Defining what your objective is will drive the influencer search, the type of content the influencers will be posting and social media themes. Work with influencers to create/share inspirational content that shows the audience why your mission & programs are important to them (ie. showing women getting back into the workforce with your programs that assist women in poorer countries with building their own businesses). Work with influencers to create/share educational content with their networks on how to use your program & build skills. Influencers share stories from your organization about the people you have helped and how they’ve benefitted. After you decide on what your objective will be, it’s time to identify the influencers your non-profit should be working with. Enlisting influencers can help increase the legitimacy of your cause among the public by spreading your name through a trusted source and can be a great way to gain new audiences, potential donors and volunteers. Working with influencers who have press experience and highly engaged audiences may also increase the chances of your cause getting press coverage and increase engagement. When you’re looking to work with influencers, keep in mind that there are three main types of influencers: top-tier, power middle and micro. Typically public figures with extremely high reach, with anywhere between 750k-1M+ fans across all platforms. They’re notable, well-known and have built their highly engaged audiences over years. Influencers in this category don’t normally work for free and have experience working with bigger brands. They usually have moderate reach of between 50K-250K followers across social media. They’re more likely to have agreeable cost agreements or perhaps none at all as they’re still building their audience & brand. These influencers have a relatively low reach, less than 10K across social media. They do, however, have highly engaged audiences and their accessibility and reliability resonate with consumers. Remember what I mentioned earlier, about how you might already have potential influencers in the form of brand advocates who are championing your cause? Look through your organization’s Facebook, Twitter, Instagram and even YouTube fans and followers for detailed analytics. Take a note of the accounts that have been commenting on your status updates, sharing your fundraising campaigns and signing up to attend your events more often as these people could be potential influencers. Outside of your own social media accounts, you should also be looking through Instagram and Twitter hashtags related to your cause. If you find a potential influencer, you should follow them and use the Suggestion feature to find accounts with similar content. Detailed, Google searches can also help you find potential influencers. Your email subscriber database would also be a good place to start because people who signed up for your newsletter are already invested in your cause and would be more likely to share content for you. Don’t assume that bigger is better when looking for influencers. Often, going after big-name celebrity or digital influencers with huge fanbases don’t provide the best ROI. In fact, working with micro long-tail influencers may provide higher conversion rates because they’re generally more engaged with their audiences. BEFORE presenting them with the offer, make sure to interact with them. Follow their accounts on different platforms, share and comment on their content and just interact with them on social media in general. Before asking them to do something for you, you need to spend some time and energy building a relationship with key influencers. When you do present them with an offer, BE CLEAR on what you want. When you present influencers with an offer, make it clear on what you need from them (Facebook posts, Instagram posts, videos etc.) and how often you need them to post. Then you need to be clear on what they can expect in return, whether it’s financial compensation or something else. Be strategic and choose quality over quantity. As I mentioned earlier in the post, make sure you define what your campaign goals are and try and engage the influencers you want to work with in early discussions on how the partnership could work. Whether it’s your first influencer campaign or your 20th, make sure to keep your influencer group small and tailor your program to each influencer. Not only is it more manageable time-wise for your organization, influencers like to feel valued and expect to be treated as individuals. So it’s important to not spread yourself too thin and give your organization time to nurture these key relationships. For more great fundraising ideas, social media and content marketing strategies. Lilian Sue is a marketing communications professional with over 10 years of experience developing integrated multi-channel marketing campaigns (copywriting, social media & PR/media relations) for lifestyle brands, indie film & television projects, B2B companies, tourism/hospitality & food/beverage brands. Learn more about her work at In Retrospect Writing Services. Share your thoughts about influencer marketing for your nonprofit in the comment section below. I’m really looking forward to reading your comments. We help Charities, Nonprofits, NGOs and Social Enterprises become much more effective. Organizations post a project on GlobalOwls and receive quality advice from dozens of Marketers and Designers.